So, there was a bit of news that happened in Iowa politics this week. The Des Moines Register story on Nate Boulton and his subsequent withdrawal from the race dominated headlines for most of the week. It shook up a still-fluid primary with less than two weeks to go until the election. And it also overshadowed a key anniversary: Kim Reynolds celebrated her one-year mark as governor on Thursday. Let’s take a look at some of the other storylines that didn’t get full stories from Starting Line this week. Starting Line caught up with John Norris on Saturday morning while he and his campaign team was launching a volunteer canvass out of a suburban Cedar Rapids home. Jackie Norris and their three sons pitched in for knocking on doors in the heat as well. Norris told Starting Line that there’s a lot of undecided voters out there and ones with “soft support” for other candidates that he’s hopeful he can win over now. Norris held a house party in Iowa City on Thursday night that drew about 80 people, including a number of former Boulton supporters. 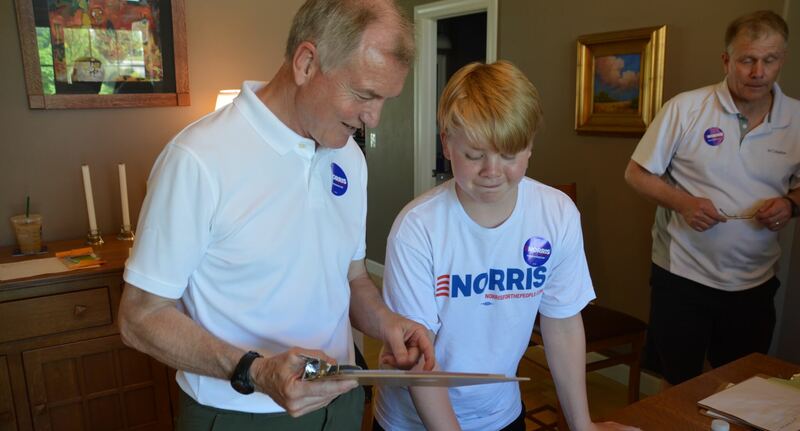 Several other Johnson County activists told Starting Line today that Norris is quickly picking up support in the heavily-Democratic county. As for winning over former Boulton backers, Norris sees his past involvement in many Iowa policy movements as reasons he could pick up their support. Two well-known legislators who used to back Nate Boulton announced Saturday morning that they are joining Team Hubbell. Representative Scott Ourth of Warren County and Representative Brian Meyer of Des Moines (who represents a district that is turning out heavily for the primary) endorsed Hubbell at a canvass kick-off event in Des Moines. At this late point in the race, there are probably some high-profile Boulton endorsers who will just wait out the primary and not back someone else. But you can expect campaigns to still try to convince as many as they can to publicly endorse a new contender to show momentum in the last week, and Hubbell has struck first in that effort. In the Democrats’ secretary of state race, which hasn’t gotten too much attention outside of Democratic activist circles, Deidre DeJear surprised in the latest finance report with a strong showing that outpaced Jim Mowrer. DeJear raised $89,702 to Mowrer’s $72,831, not bad for a first-time candidate running against someone who had significant fundraising success in his previous bids for office. DeJear got a handful of $1,000+ checks, but by and large her total was built up through small and medium-size donations. EMILY’s List kicked in $5,000 and Progressive Women For Change gave $2,000. DeJear’s fundraising will be very useful in helping boost her name ID among statewide Democrats who likely haven’t heard of her before this year. Either candidate will end up getting significant national support in the general election as Democrats focus more and more on secretary of state races and voting rights. You can probably figure out most of the main takeaways here. Finkenauer clearly feels like she’s in a secure position to win the primary, deciding to hold on to a significant amount of funds in the 1st District race. Having that much to compete on TV against Blum immediately after the primary is very helpful in case Republicans attack her right away. Of course, if Republicans were also positive that Finkenauer will handily win the primary, they could have started advertising against her by now. D’Alessandro has spent all the way down in his 3rd District primary, but he’s also already reserved TV time through the primary. Mauro could probably put in more of his own money if he really feels like it, but overall, Axne has a cash-on-hand advantage as the unpredictable Des Moines-based primary comes to an end. Scholten in the 4th District has more than enough funds to close out the primary with a serious TV buy, even if only in the Sioux City market. He’s run the most extensive campaign in the race, but Democrats are eager to vote for female candidates in primaries this year, so this contest isn’t completely over yet. Two candidates got some nice momentum-boosting endorsements this past week. The Des Moines Register endorsed Hubbell in the gubernatorial primary and Axne in the 3rd District race. Hubbell also got the backing from the Quad Cities Times. The Times made a particularly helpful point for Hubbell: they noted that he’s improved significantly as a candidate throughout the campaign, becoming both more at-ease and passionate in personal settings. This spending adds to the $40,000 that CCI’s independent expenditure committee has already spent to help Glasson. That money has gone to field organizing and several rounds of direct mail. Eddie Mauro got a couple additional public endorsements this past week. Polk County Sheriff Bill McCarthy and State Representative Ako Abdul-Samad put their names behind Mauro’s candidacy. Some party activists weren’t so sure of Mauro’s chances in the 3rd District race when he first got in, but extra endorsements this late in the primary show that he’s still winning over key elected officials who believe he has a good shot at the nomination. I have a lot of problem with Hubbell. The governorship should not be take for granted nor the plumb for one “predestined” candidate. Of course, I agree that ANY candidate is better than Reynolds. But Hubbell? Glasson is a far better choice. Glasson’s stance on clean water efforts and factory farms. 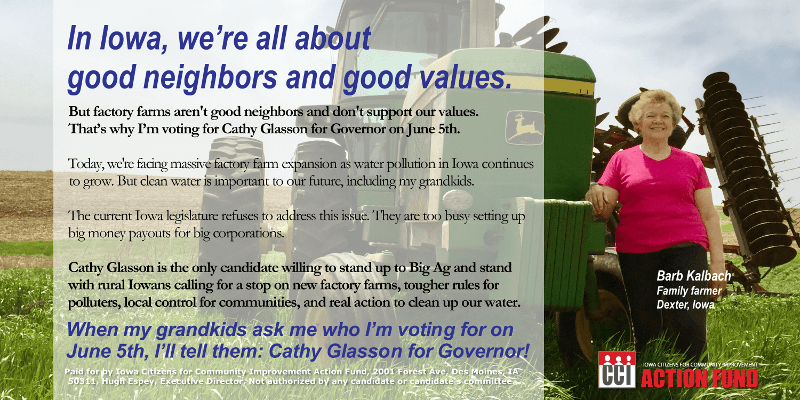 Only Glasson will stand up to big agriculture that is cannibalizing rural Iowa.